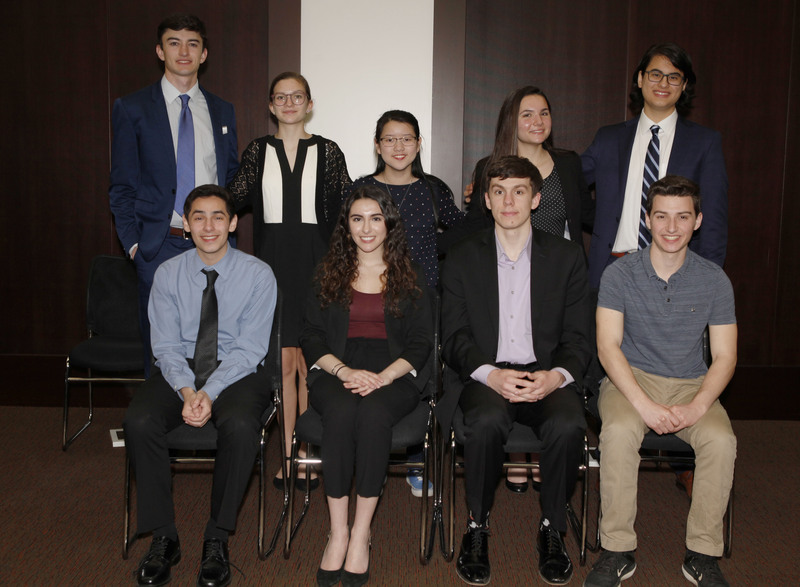 Congratulations to the mock trial team from Colts Neck High School of Monmouth County who won first place in the 2019 Mock Trial Competition. 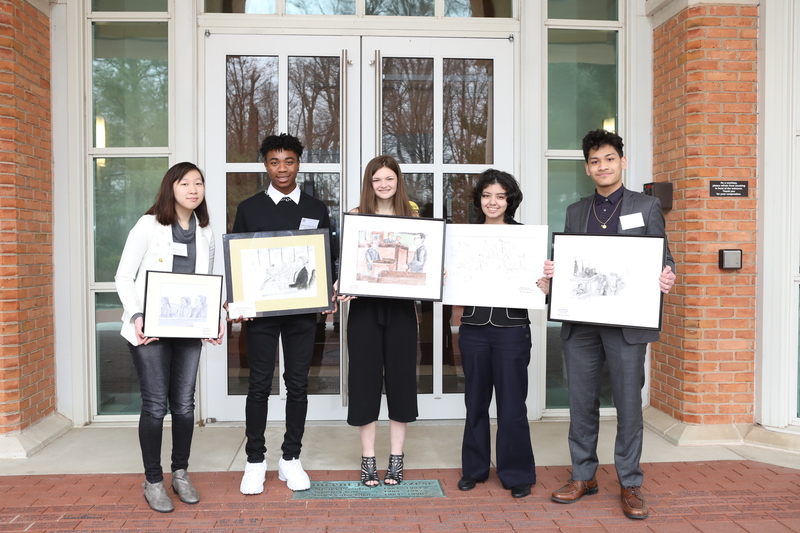 Winners of the 2019 High School Courtroom Artist Contest display their winning entries. 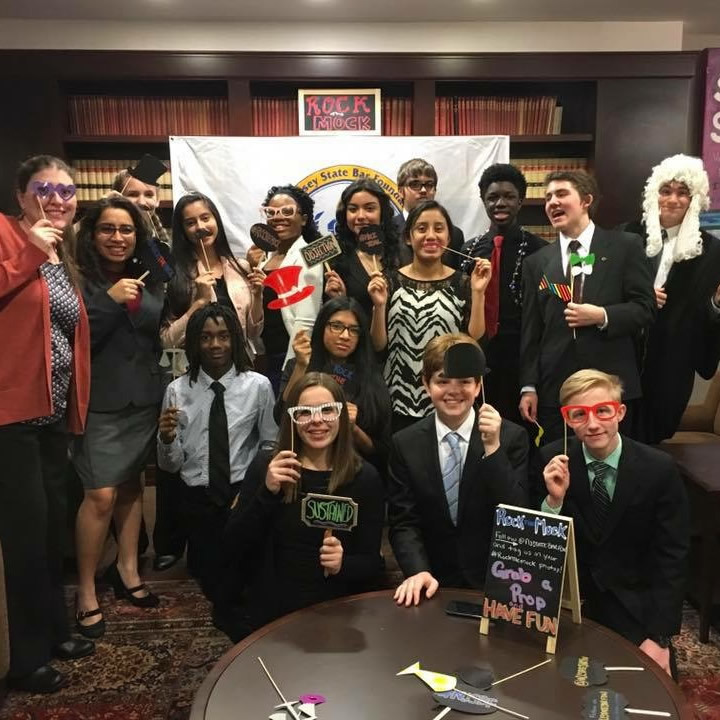 Students get into the spirit of the NJSBF’s “Rock the Mock” photo booth at the Southern, Northern and Central Regional Mock Trials. Ray Brown moderates the Foundation’s Violence Against Women on College Campuses Update 2018 Program. 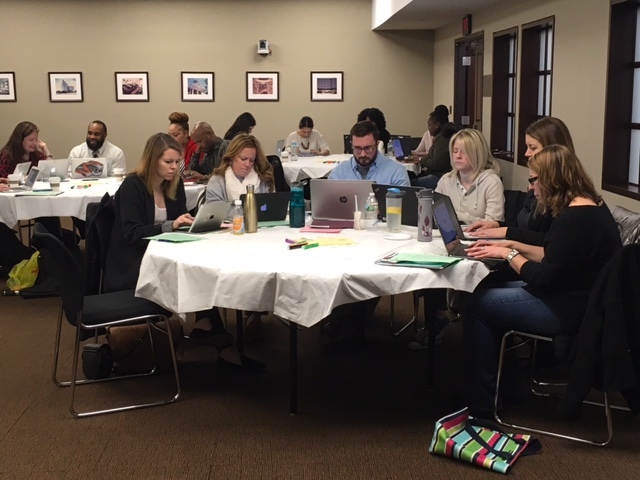 Attendees take the Implicit Association Test (IAT) on their laptops at the Foundation’s Why We Bully: Unconscious Bias training. 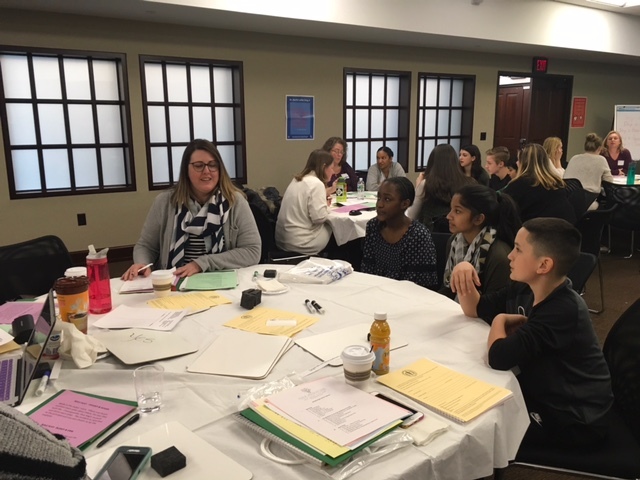 Student peer mediators assist attendees at the Foundation’s Middle/High School Peer Mediation training. 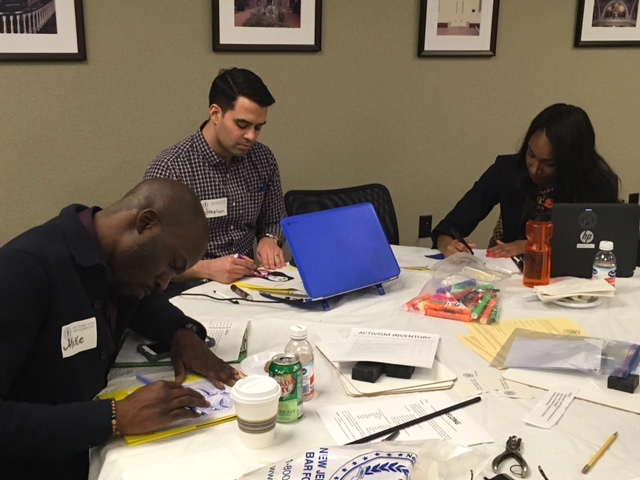 Attendees work on drawings for a Respect Quilt at the Foundation’s Elementary Character Education training. 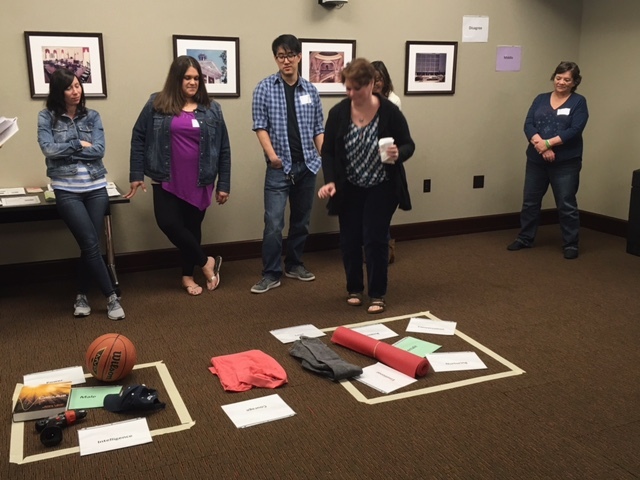 In an interactive group activity, attendees at the Foundation’s Why We Bully: Understanding HIB Characteristics training, challenge their ideas of stereotypical gender roles. 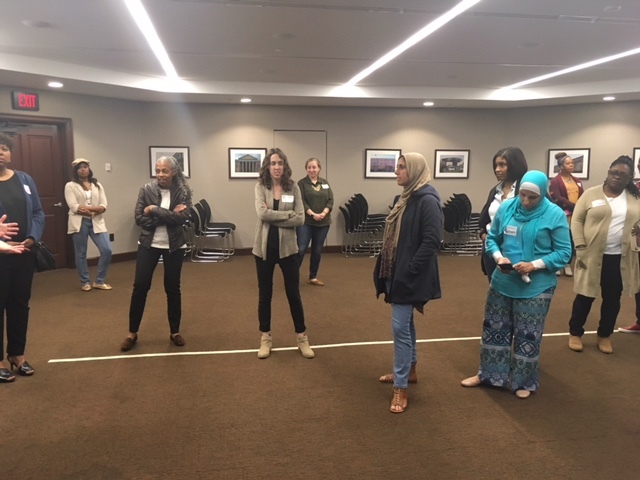 In an exercise titled “Privilege Walk,” attendees to the Foundation’s Why We Bully: Talking About Race training learn what privilege means and how it can propel them in front of “the line” or put them behind it. 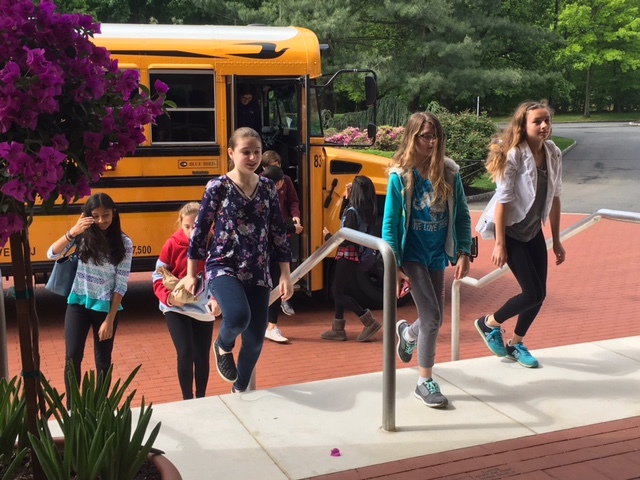 Middle school students arrive at the New Jersey Law Center to participate in the Foundation’s Law Adventure Program. 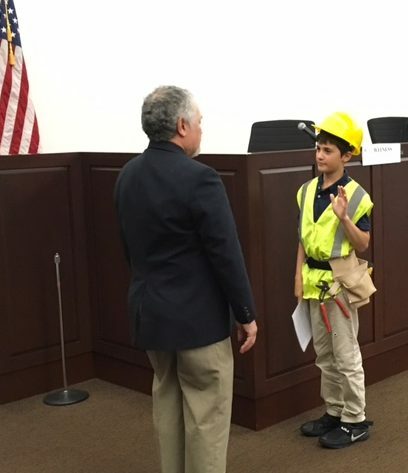 A “witness” is sworn in at the Foundation’s Law Fair Program. 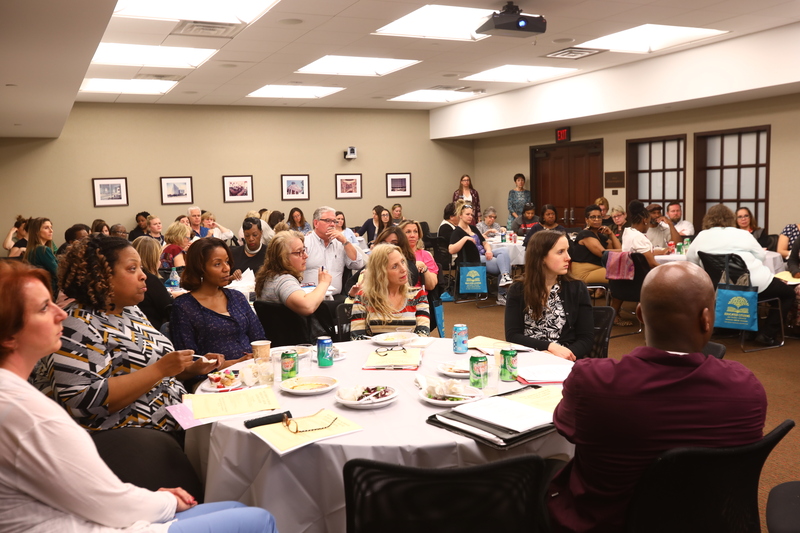 More than 65 educators attended the 2018 Student Assistance Coordinators Workshop. 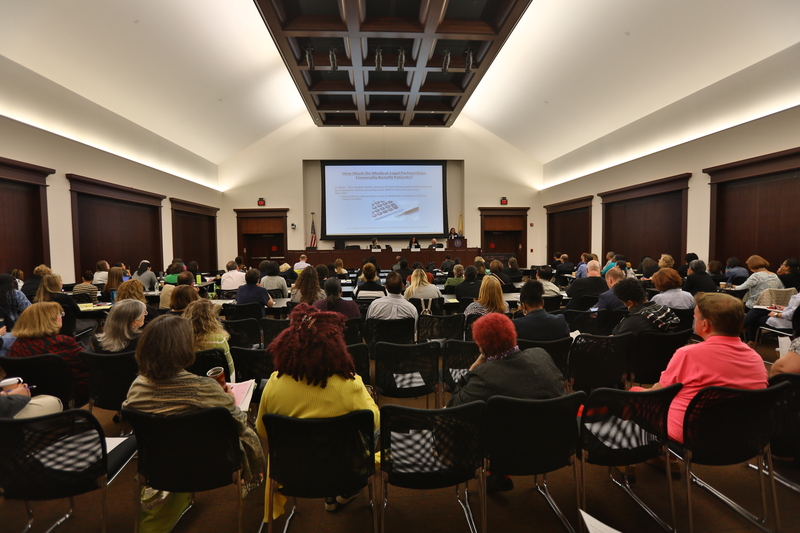 Attendees at the Law & Disability Issues Conference listen to the plenary session that focused on medical-legal partnerships. 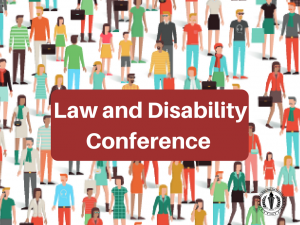 The Law and Disability Conference will be held at the New Jersey Law Center on May 9, 2019 from 9 a.m. to 1 p.m. 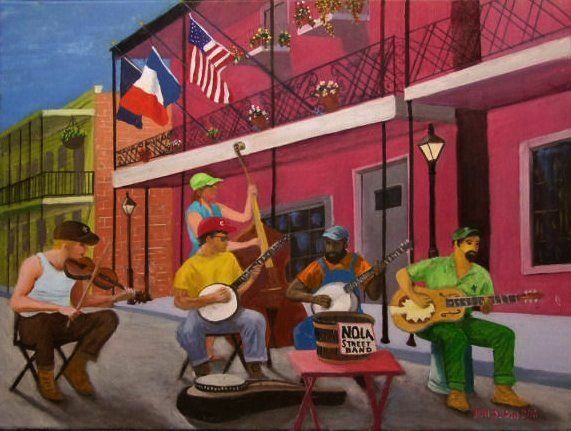 The conference’s Plenary Session will focus on Integrated Care – Behavioral Health, Physical Health, & Social Determinants of Health, while concurrent workshops will explore Addiction and the Opioid Crisis, Domestic Violence and Special Education. For more information, download the conference brochure or click here to register. 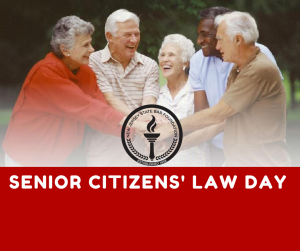 The Senior Citizens Law Day Conference will be held at the New Jersey Law Center on June 4, 2019 from 9:30 a.m. to noon. 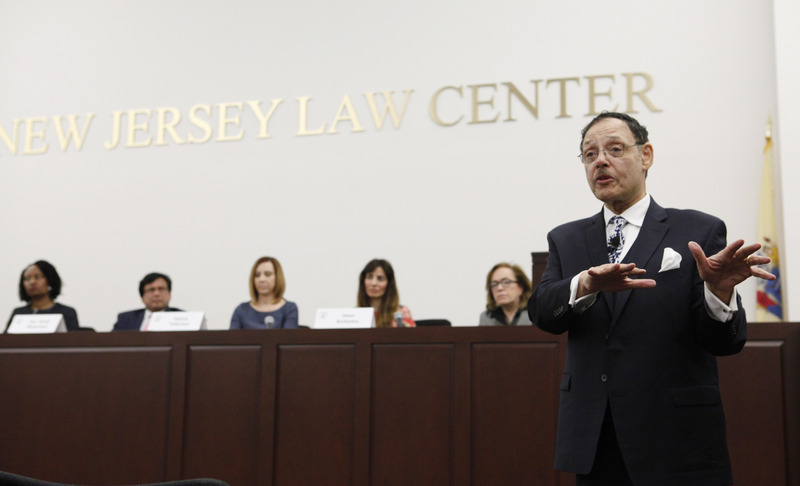 Topics to be covered include elder law and estate planning, elder abuse, scams and fraud. For more information, download this flyer or to register, click here. 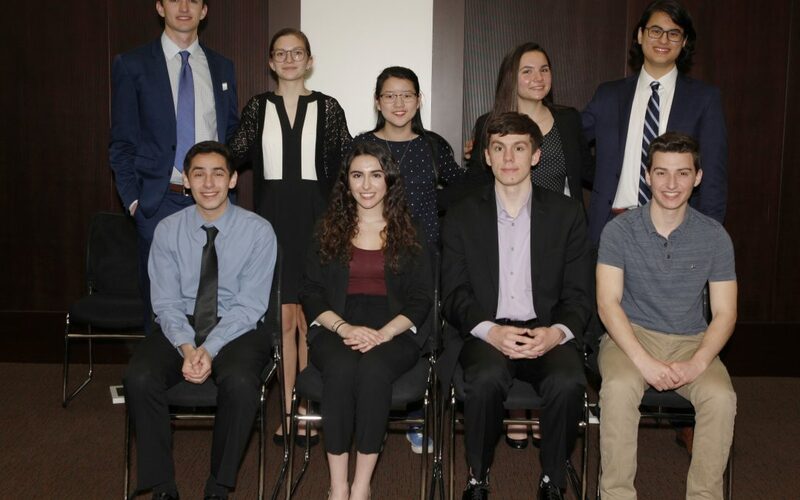 Volunteer for the Foundation’s Speakers Bureau or become a mock trial coach.